E-Prime, the software suite of Psychology Software Tools, is used for designing and running custom psychological experiments. The E-Primer, a Leiden University Press publication, is the first complete guide and textbook on the world of E-Prime. 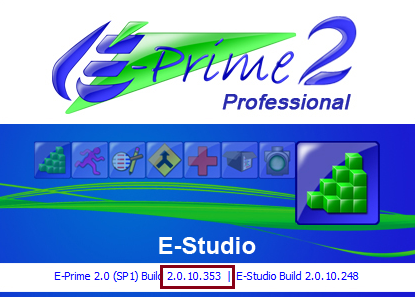 The E-Prime Production Release version 2.0.10.x introduced several useful features that were not available in E-Prime version 2.0.8.x. However, we recently discovered that some existing features (or their settings) have significantly changed since we published the E-primer. We will list those here below. In case you have decided to update E-Prime to version 2.0.10.x please read PST's documentation about this first. Please do not skip the issues we raise here: you will surely encounter some difficulties as soon as you start designing new or adapting existing experiments in version E-Prime 2.0.10.x (see here in case you upgrade an old experiment to an E-Prime 2.0.10.x file). Furthermore, when running experiments described in The E-Primer, you need to solve some of the issues described here. We are currently working on an addendum to our book that describes these changes. In the meantime, you can use the summary of the most important troubleshooting. E-Primer. Simple theme. Powered by Blogger.